Pick up your print copy of the Buenos Aires Times, inside the Perfil newspaper, each and every Saturday. This Saturday in the Buenos Aires Times, we cover the biggest stories of the week – and a few that haven't yet caught the eye. From Washington, Santiago del Carril will explore the improving relationship between the Argentine and United States governments, with a special focus on lobbying and the changing relationship in the corridors of power in both countries. 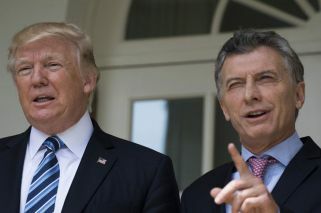 Speaking to experts and sources from both sides of the relationship, del Carril will explore the contrasts between the approaches of the Mauricio Macri administration and the previous government led by Cristina Fernández de Kirchner. Elsewhere in local news, Jacob Meschke brings us news of a new study that lays bare how Argentines feel about the media and its coverage of the major issues in politics. Consulting local and international experts, Meschke will dig into why Argentines seem to lack confidence in their media outlets. Next, we’ll focus on Latin America, where Brazil’s military have taken over security in the nation’s most iconic city, Rio de Janeiro. We’ll also pay a visit to Venezuela, where the crisis-stricken country is locked in a war of words over the controversial decision to call elections. In culture, we’ll cover the unique pairing of a rock star and a local poet. The AFP’s Shaun Tandon tells us how Bryce Dessner, best known as the guitarist with award-winning rock band The National, fell for the words of the late Argentine feminist writer Alfonsina Storni, using her creations as the basis for his new song cycle. In sports, we will look at Argentina’s performance in the Winter Olympics, while regular columnist Dan Edwards tackles the offensive chanting that took place in stadiums against President Mauricio Macri, exploring the perceptions held by some that Boca Juniors have too strong an influence among the game’s authorities. Finally, we’ll bring you a packed Opinion and Analysis section, as a full complement of our name columnists return to the pages of the Times. Robert Cox talks about the recent US school shooting, James Neilson explores the high standards the Mauricio Macri administration must keep up, Agustino Fontevecchia covers the political economy, Michael Soltys answers another Economic Question, while Andrew Graham-Yooll talks Brexit. Finally, in another typically well-researched piece, Carolina Barros brings us worrying news from Venezuela and beyond, focusing on the guerrillas of the National Liberation Army (ELN) from Colombia. All said, it’s another packed edition of the Times. Remember to pick up your copy, each and every Saturday, inside the Perfil newspaper!